Well, I've finally gone and done it. I purchased a new sewing machine! Winging it's way to me via UPS (I bought over the phone from my Mom's local shop after Mom did all the research and shopping for me--thanks, Mom!) 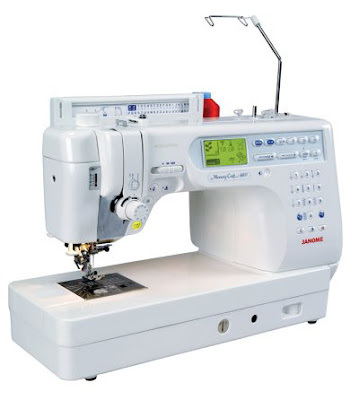 is one Janome 6600, which surprises me since I assumed I would be buying a Bernina. In the end, I chose the Janome mostly because it has a longer arm, which means I can fit more quilt into it. But I think either machine would be fantastic. I mean, doesn't this just look like it's going to be fun? Bookins. Trade your books and pay just the cost of shipping. Now I won't feel guilty parting with books to save space, since someone else can enjoy them. Peter Bjorn and John. Jump on the bandwagon! They are clearly a favorite at KCRW as well, particularly their song Young Folks. Making finger puppets. We're making some friends for the puppets Todd brought back from Barcelona a couple of years ago. Ours are made of Paperclay (just because it was handy--other materials would work equally well, I'm sure) and are being painted with acrylic craft paints. A little Benjamin Moore for the hair, I think, since I still have brown test samples from the dog mural. We're making a family of Mr. Man, Mrs. Lady, little girl, and one pig. I'm sure they'll be joining the Little People who take the school bus to our miniature MoMA several times a day to look at "aht." Learning to use chopsticks. This kid likes sushi so much, and with her new clothespin-style chopsticks she's got it going on! Don't worry--she doesn't actually eat the yarn; we give her the real stuff when she gets hungry. 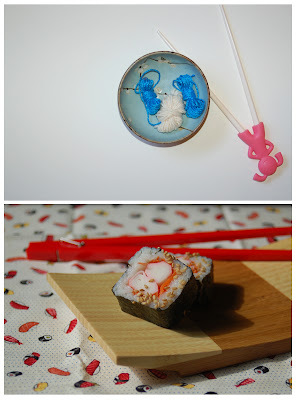 I think I'll have to make her something with that sushi-print fabric. First project for the new machine? Hurray for new toys! Although that machine looks scaaaary! Can't wait to hear how it goes. Congratulations on your new purchase! I know so many people lately who have bought that Janome. It's making me wish I needed a new machine. oh that machine looks serious! can't wait to see what you pump out on that little baby!! congrats on the new machine. woo hoo!! You're getting me more exited about my impending sewing machine purchase! And I secretly always wanted a pair of the clothes pin chopsticks. Our sushi place has them available for kids and I've always felt awkward about asking to use them. I think they are so fun! I love the practice sushi and the "aht" - that is some savvy child you are raising there. congratulations on your new sewing machine. I just bought a new one back in october, and I still feel very spoiled and happy about it. congrats on the exciting new machine... so many buttons and wonderful things ahead! love the little finger puppets too. very cute! First time in your blog. What lovely things! I wish I knew how to make bags like that. Your new machine looks very professional. Congratulations on your new machine! I've been limping away on my old, cheap one for too many years. Janome all the way I say. I have loved mine pasionately and it is the entry level model! Here's to many happy hours of sewing for you. I luv the chopstick! I'll have to check out Melbourne's Chinatown and hunt some down for friends with kids.